Looking for a few new swim shorts or some jazzy après-beach attire for your tioman trip? Or keen to get a couple of sunny island souvenirs to surprise your family or friends back home? 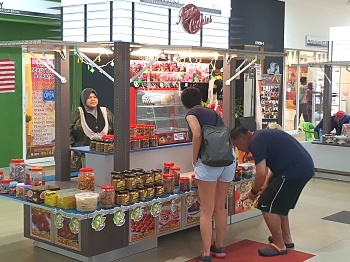 Even if you just want to pop in for some sun screen, mozzie spray or a couple of snacks to keep the munchies at bay, Mersing Harbour Centre offers it all. 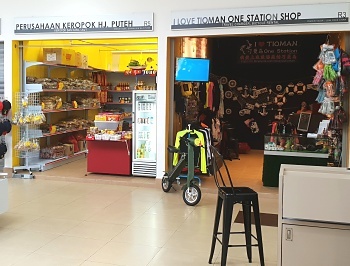 Have a stroll around the various shops, kiosks and cute little pushcarts that are peppered around the complex and are run by local entrepreneurs. You're bound to find some inspiration. Attention all as yet unlisted shop, kiosk and pushcart owners: Want to be included in this page? Let us know here. Want to do a virtual browse through Mersing Harbour Centre first? Use below table to see what's on offer. F & B = eatery. Artwork, gifts, t-shirts , keychains etc. Attention all as yet unlisted shop, kiosk and pushcart owners: Want to be included in above table? Let us know here.